Sonoma County Pride is now recruiting volunteers for Pride 2018. Please complete the form below and indicate what task and times you are available. Our volunteer coordinator will reach out to you to confirm details. Each Sonoma County Pride volunteer working a full four-hour shift will receive a Sonoma County Pride t-shirt and lunch the day of the Festival. 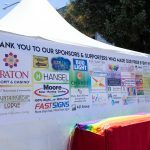 In addition, Sonoma County Pride will be throwing a celebration party shortly after the event in honor of YOU! Each Sonoma County Pride volunteer working a full four hour shift will receive a Sonoma County Pride t-shirt and a lunch.